Well, OK property escrow closed! Praise the Lord! 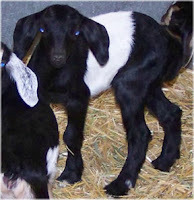 We have one wether (adorable F2), one yearling doe (F2, polled), and a Boer doe (96.88%) available for sale. Email me for more info and for pictures. Lots going on. . . done with kidding! Yay! Wow, I haven't been able to post for a while now! Still, I haven't gotten the new pictures of the bucks on the website :). We are done with kidding, yay! Just in time to start getting ready to move! On June 4th, Hug kidded to one big buckling. She was accidentally bred by a Boer buck, thankfully she went a few days early. The kid was in a bad position (and big!) 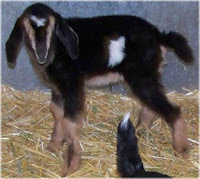 and therefore made it a pretty difficult kidding, but Hug and the soon-to-be wether, named Rustler, are doing wonderful. Pictures will be up on the website soon, Lord willing. Hello! I have been updating the website. There are updates on the "Boer Doe" page and on the "Bucks" page. We took new pictures of Quiet Wyatt and Junior Mint, our 2 yr old Mini Nubian bucks, this morning. So I hope to get those up when I can in the next few days. In the meantime, check out the other updates! Triplets were born May 30th! Their dam is PawPawNin LaWanda and their sire is PawPawNin Junior Mint. There are two bucks and one doe. All of them are very colorful and cute ;)! Here are some pic tures!